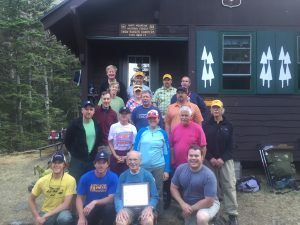 On May 28, 2016 (the hottest day of spring thus far), my wife Susan and I trekked up to Tuckerman’s Ravine on Mount Washington to attend the Mount Washington Volunteer Ski Patrol’s (MWVSP) end-of-season activities. It was a beautiful day and, while the parking lot at Pinkham Notch was full, we did not encounter very many skiers/hikers on the trail. A few intrepid skiers headed up into the bowl, but with limited terrain and dangerous icefall, the retreat back down was pretty quick. Then, it was time to get down to business. While the meal, frivolity, and camaraderie were great, I attended for a very specific reason. In the absence of our annual banquet, there were a couple of awards that very much needed to be presented – awards that may be once in a lifetime. Oh sure, I have awarded National Appointments, and conferred many service awards to very experienced, longstanding patrollers. However, what I would do on this evening, I doubt that few in my position will ever have the opportunity or enjoyment. On this May evening, it was my honor to present to Mr. Roger H. Damon, Jr. National Ski Patrol’s Distinguished Service Award. This award is presented to individuals who have performed extraordinary service to the National Ski Patrol and the skiing and riding public. And, before you think that this might not be such a monumental event, as there are many of these given out each year, what made this evening so extraordinarily special was the simultaneous presentation of an award recognizing completion of Mr. Damon’s 70th season as an active, patrolling member of the National Ski Patrol. Yes, I did say 70th season!!!! In my presentation of these awards, I noted the exceptional commitment required to be a member of this particular patrol. As many of you know, patrolling at Tuckerman’s Ravine on Mount Washington is quite unique. There are no lifts here to get you to your duty station – reporting for duty at this area generally requires a 2.4-mile hike over a 2000-foot elevation change, while frequently carrying a backpack with upwards of 50 pounds of gear and supplies. Oh sure, there is the occasional ride in the U.S. Forest Service snow cat. But in a season like we have just had, those were few and far between. 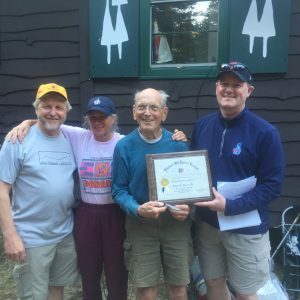 In Mr. Damon’s case, I’m not sure the correct superlative exists to describe his level of commitment, having served the last 48 years of active membership as a patrolling member of the Mount Washington Volunteer Ski Patrol. In addition to his service, Mr. Damon has been quite active in the avalanche program and is credited with developing and teaching NSP’s first basic and advanced avalanche training courses in the Eastern United States. He also taught an avalanche workshop for the Appalachian Mountain Club (AMC) at Pinkham Notch, New Hampshire. This AMC course proved to be popular for the general public as it provided a full day of fieldwork in avalanche terrain including terrain analysis, snowpack stability assessment, and probe line management. 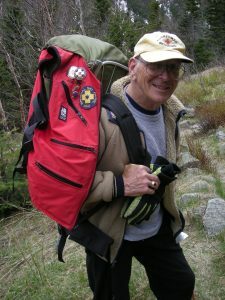 For his contributions to the Avalanche Training Program, the Eastern Division of the National Ski Patrol in 2013 named an award for Mr. Damon, the “Roger H. Damon Jr Eastern Division Avalanche Award,” for which he was the first recipient. 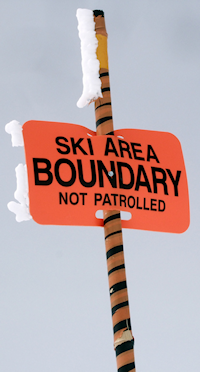 Also of note, the U.S. Forest Service team staffing Hermit Lake is losing two key members, as Lead Snow Ranger Chris Joosen and Snow Ranger Jeff Lane will be moving on from their posts. Given their level of experience on Mount Washington, and the close relationship they developed with the MWVSP team, both will be sorely missed. While here, I also had the opportunity to thank them and to present each with a small gift in appreciation of their efforts to keep skiers and riders safe while on the mountain, and for providing outstanding education to many NH Region members over the years.